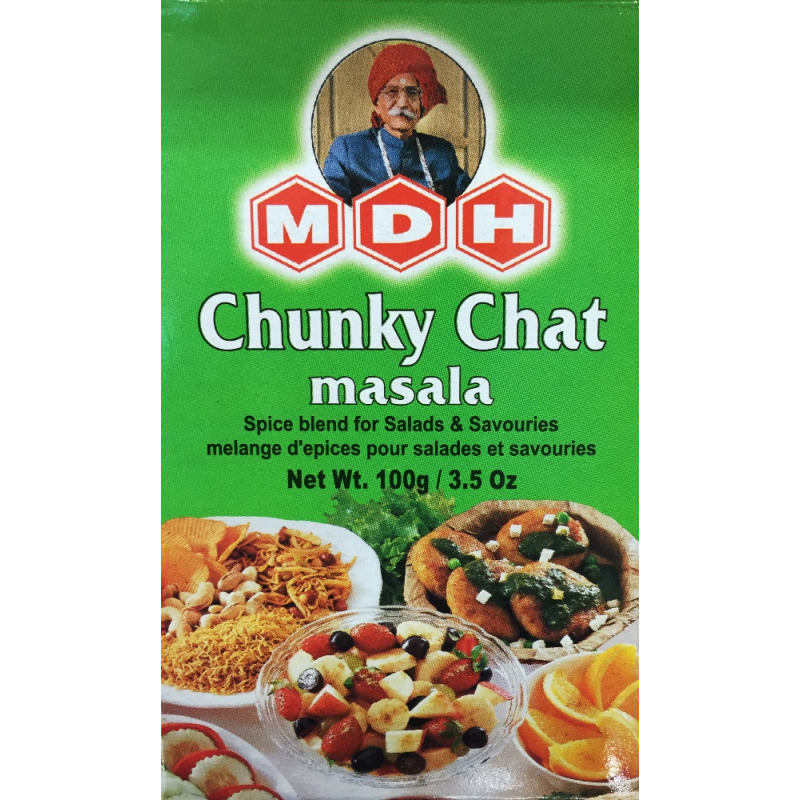 MDH Chunky chat masala is widely used for seasoning in the Indian cuisine. 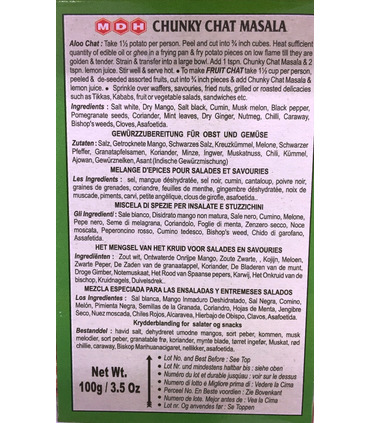 This spice gives a tangy, ‘chatpata flavour’ and is added to snacks, fruit and vegetable salads, juices, etc. It can also be sprinkled over waffles, savouries, fried nuts, raita, grilled and roasted dishes such as Tikkas, Kebabs, sandwiches etc. Chat masala adds a delicious sourness to the dish. Take 1½ potatoes per person. Peel and cut into ¾ inch cubes. Heat sufficient quantity of edible oil or ghee in a frying pan & fry the potato pieces on low flame till they are golden & tender. Strain & transfer into a large bowl. 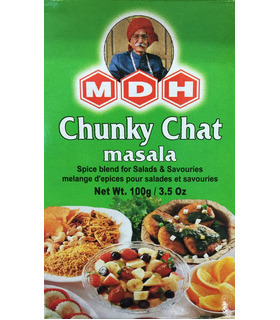 Add 1 tsp Chunky Chat Masala & 2 tsp lemon juice. Stir well & serve hot. Take 1½ cup per person, peeled & de-seeded assorted fruits, cut into ¾ inch pieces & add Chunky Chat Masala & lemon juice. 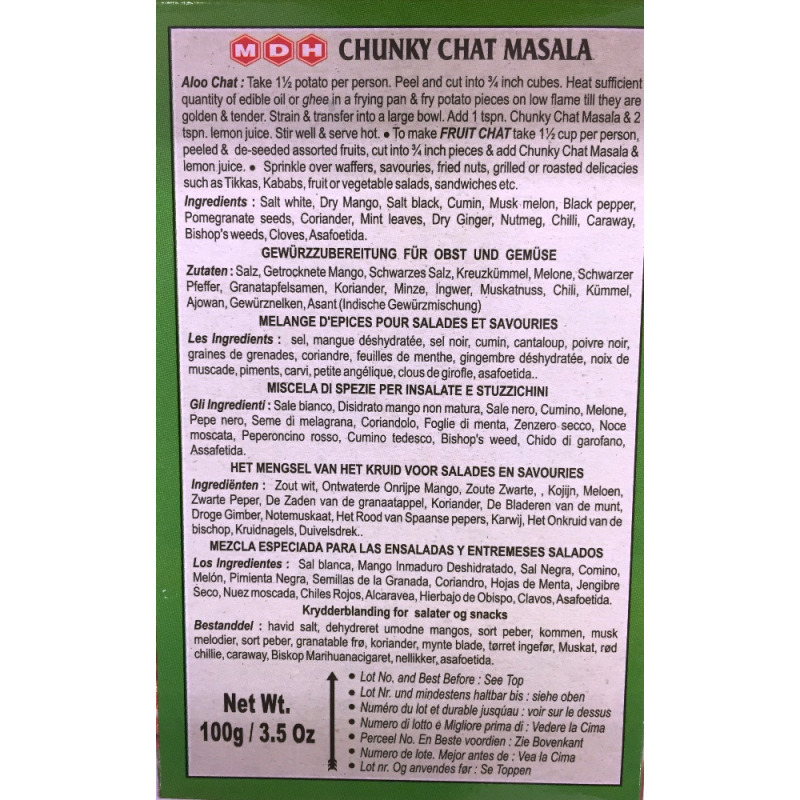 White Salt, Dry Mango, Black Salt, Cumin, Musk Melon, Black Pepper, Pomegranate Seeds, Coriander, Mint Leaves, Dry Ginger, Nutmeg, Chilli, Caraway, Bishop's Weeds, Cloves, Asafoetida.